We know, we know... 3 days in Paris is hardly enough time to see and experience everything the French capital is known for. 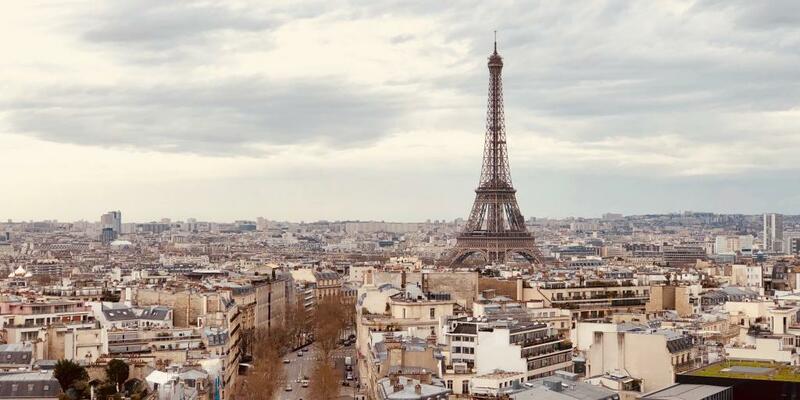 Paris is the most popular destination in the world, after all, and it's easy to see why the City of Love and lights is considered the perfect city break destination. And yet, if you plan your time smartly and know exactly where and where not to go, you can actually get quite a lot done on in a weekend - including plenty of eating, drinking, shopping and sightseeing. The perfect weekend in Paris involves all that and more, from discovering quaint bookshops to chilling in canalside cafes and dancing on tables in secret wine cellars. Here's how to make the most of that Parisian je ne sais quoi everyone talks about. Direct Eurostar trains from London to Paris depart from St Pancras several times a day, with the journey taking just over two hours. If you're flying in, there are 3 international airports within a manageable distance of the city: Charles de Gaulle Airport (35 mins by train), Orly (45 minutes by bus and then train), and Beauvais-Tille Airport (1.5 hours by shuttle bus), the latter of which tends to receive most of the budget airlines. The Paris subway system (Le Métro) is cheap, incredibly prompt and easy to use, whereas taxis can be a bit difficult to come by. Our advice? As soon as you arrive in Paris, buy a carnet of 10 single metro tickets per person, which should be plenty to get you through the weekend. Best of all, they never expire, so if you have some left over, it just means you'll have to book another trip to Paris. What a shame! We'll begin our Paris itinerary away from the standard tourist hotspots by heading to Le Marais, which straddles the 3rd and 4th arrondissements. This ultra-cool neighbourhood, one of the oldest in Paris, is also one of the hippest. Concept stores and vintage boutiques sit alongside quirky cafes and lively restaurants, all of them filled with Paris's young and fashionable bohemian set. Throughout its history, Le Marais has taken on multiple identities: first it was the seat of the Order of the Temple, later it was considered the most fashionable aristocratic residential area, then it transformed into the Jewish quarter, and finally it became centre of art, fashion and LGBT culture. In short, it's a veritable melting pot where you'll be exposed to every type of Parisian under the sun. Start your tour of Le Marais at the oldest market in Paris, Marché des Enfants Rouges, on Rue de Bretagne (nearest metro stations: Filles du Calvaire and Arts et Metiers). 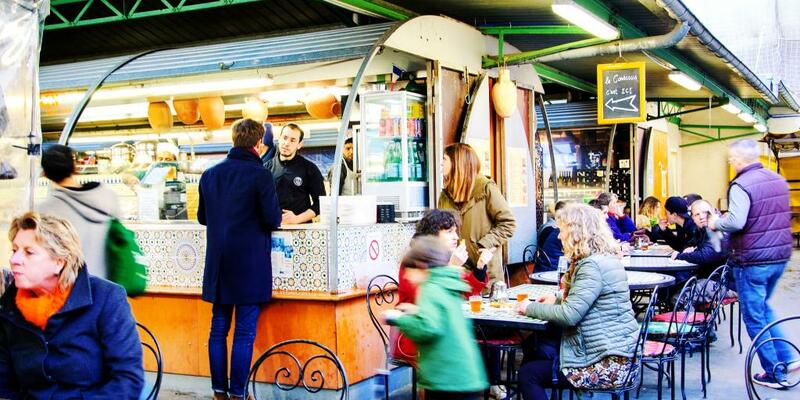 This incredibly atmospheric marketplace is filled with food vendors serving up dishes from all over the world, from Japanese bento boxes to aromatic Moroccan couscous. For a quintessentially French treat, we highly recommend grabbing a seat at one of the picnic tables and ordering a crepe or a sandwich and a coffee from Chez Alain Miam Miam. All the ingredients are organic and come from local suppliers, and trust us on this one - the food is positively delicieuse. Once you've fuelled up for the day, have a wander around the neighbourhood and do some window-shopping. 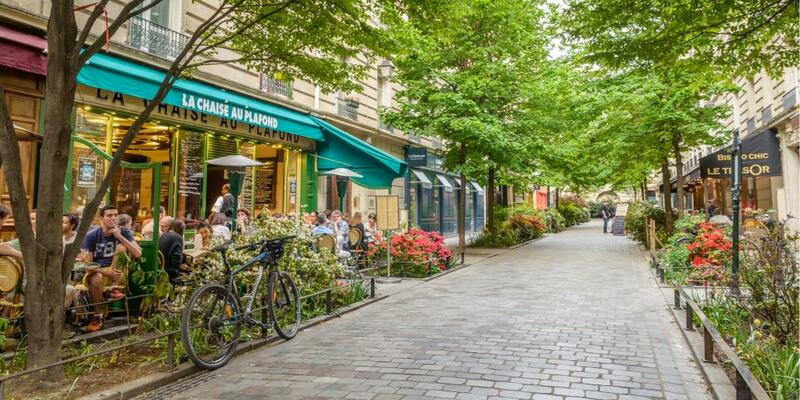 The picturesque Rue Vieille du Temple, an ancient street cutting right through the centre of Le Marais, is lined with dozens of trendy shops and local businesses worth popping into if you're after some retail therapy. Even if you're not, it's a lovely road that encapsulates the unique spirit of Le Marais. Just off of Rue Vieille du Temple you'll find Rue des Rosiers, a narrow pedestrianised street at the heart of Paris's Jewish Quarter. It's known as the place to get delicious falafels (particularly at L'as du Fallafel restaurant), but it's also home to some cool shops and vintage stores worth checking out if you're in the mood. And if you walk all the way east on Rue des Rosiers you'll eventually hit Place des Vosges, the oldest planned square in Paris. This is the perfect spot to perch on a park bench for a view minutes and do some people-watching before continuing on to your next stop. And where is the next stop, you ask? 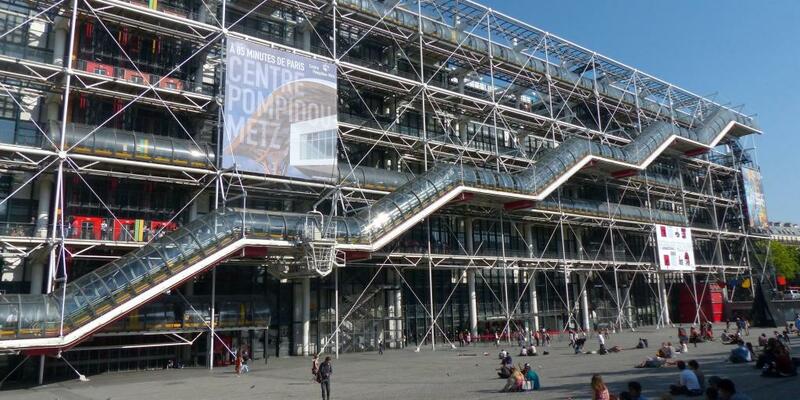 Why, it's the nearby Centre Pompidou museum, one of the most distinctive architectural marvels in the city. This incredible modern art museum, which looks like a criss-crossing tangle of steel rods and rainbow piping, caused some controversy when it was first opened in the 70s in one of Paris's most historic neighbourhoods. These days though, it's a top tourist attraction and one of the most recognisable sights in the city. It houses a public library, the IRCAM (a centre for acoustic research) and the Musée National d'Art Moderne, containing the second largest collection of modern art in the world after New York's MOMA. There's also a fabulous restaurant (Georges) with amazing views on the rooftop floor. 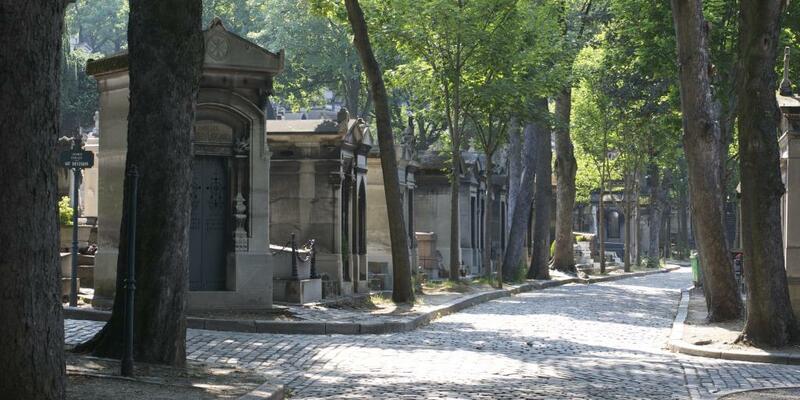 After you've had your fill of art and culture, hop on the metro from the Arts et Metiers stop to Père Lachaise cemetery, one of Paris's more offbeat tourist attractions. This sprawling 110-acre graveyard in the 20th arrondissement is the final resting place of dozens of famous figures: Jim Morrison, Edith Piaf, Oscar Wilde and Marcel Proust are among the 300,000-ish people buried here. Buy a map at the entrance to help you find all the different headstones. It may sound less than appealing to spend the afternoon traipsing through a graveyard, but trust us, this is a true hidden highlight. Plus, the peaceful atmosphere offers a welcome respite from the hustle and bustle of central Paris. There are endless dinner options in Paris, of course, but sometimes it can be difficult to circumvent the tourist traps. 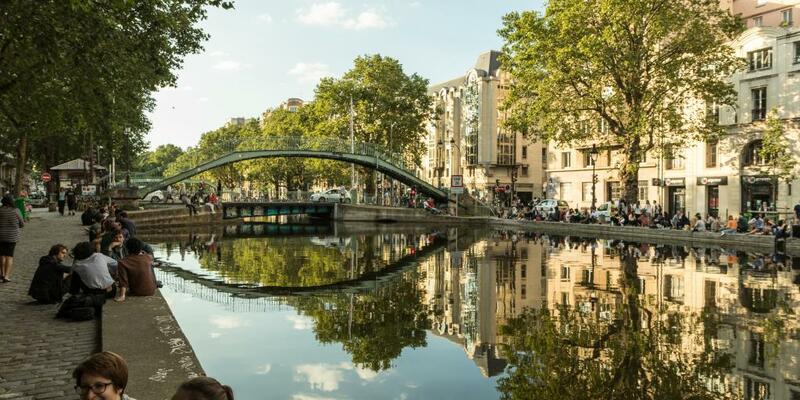 One spot where you're sure to mingle with locals is the trendy Canal Saint-Martin neighbourhood, situated about 21 minutes northwest of Pere Lachaise on the 2 line. Much like Landwehr Canal in Berlin, this is where the cool kids hang out. The young and the restless - also known in Paris as the 'Bobo' (bourgeois boheme) - bring their guitars and picnic blankets to the banks of the canal to chill out between bar-hopping and window-shopping along the side streets. Have a wander around the area before taking your pick from cosy boulangeries, laid-back bistros and trendy eateries for dinner. Before rolling into your hotel bed, pop into the canalside Point Ephemere bar for a beer and some live music. It's a bit hidden from the main street along a narrow cobblestone alleyway, giving it a secretive allure. Rise and shine! 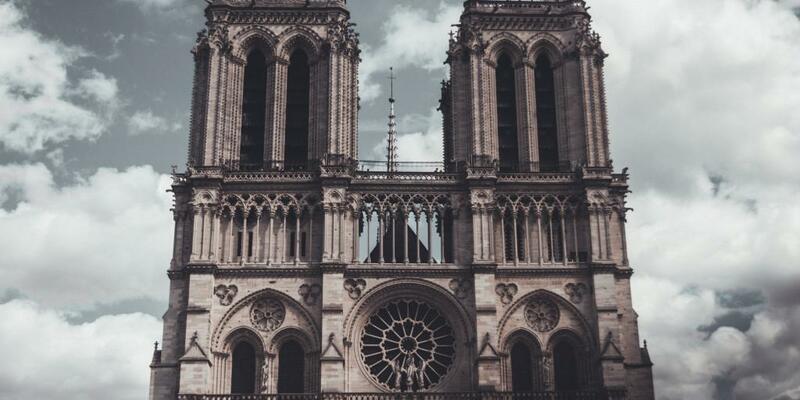 Today you're going to experience quintessential Paris, beginning with an early morning visit to the Notre Dame de Paris, one of the most famous cathedrals in the world. (Nearest metro station: Cité). The medieval Catholic Notre Dame, which dates back to the 12th century, attracts around 10 million visitors every year, and for good reason. 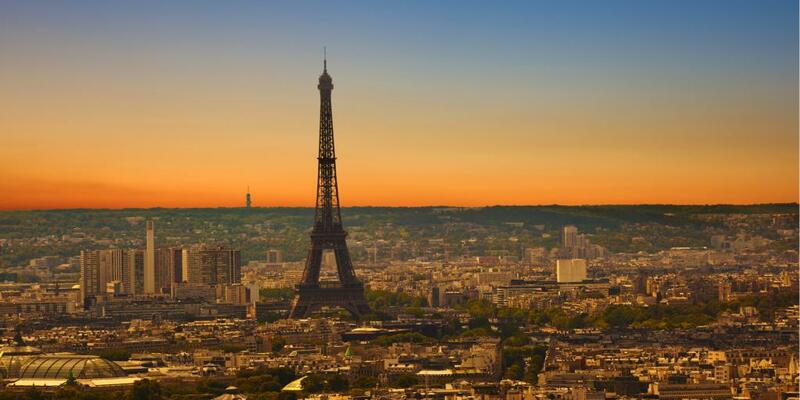 It's widely considered a masterpiece of French Gothic architecture and it's the symbolic heart of Paris itself. By visiting in the morning (we're talking 9:30am at the latest - trust us, it's worth it! ), you should be able to avoid the crowds of tourists that tend to arrive later on. Step into the Notre Dame and prepare to be blown away by the spectacular stained glass windows, the incredible 13th-century organ (the largest in France) and the wonderfully peaceful atmosphere. Make sure you climb up to the bell tower to get an up-close glimpse of the famous gargoyles carved into the exterior. From here, cross the Pont au Double bridge and turn right along Quai de Montebello. On your left you'll see Shakespeare and Company, a famous and incredibly picturesque English language bookstore just steps from the river Seine. If you love a good nook and cranny, you'll have a whale of a time exploring the ins and outs of this shop, whose every wall and surface is covered in books. The first Shakespeare and Co was opened on rue Dupuytren in 1919 by Sylvia Beach, an American expat, and it quickly became a meeting point for some of the era's best known writers like Ezra Pound, Ernest Hemingway and James Joyce. That particular building was closed in 1941 during the German occupation of Paris, and a new one (the one that still stands today) was opened in 1951 by another American, George Whitman. Shakespeare and Co sells old and new tomes in a whole variety of genres. 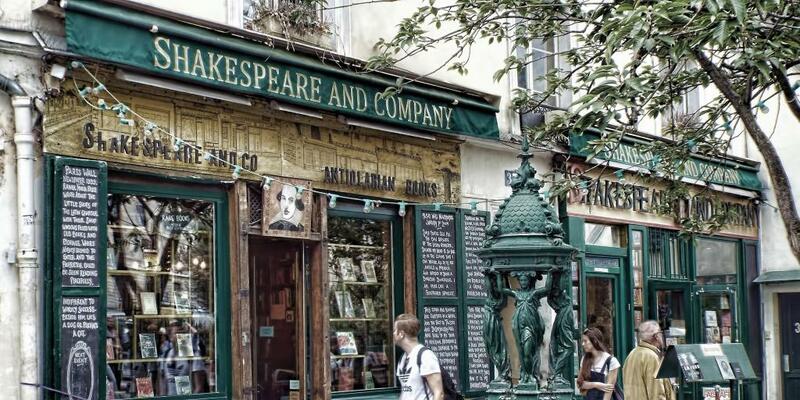 Spend some time perusing the bookshelves before fuelling up with a cafe au lait at the Shakespeare and Co cafe next door. You might want to try one of the delectable pastries or vegan treats while you're at it. Onwards and upwards, as they say. Your next destination is the almighty Musée du Louvre, the largest and most popular art museum in the world. One could legitimately spend all day in this gargantuan museum, which is spread over four levels and has an area of over 60,000 square metres. As such, it's important to fuel up before taking it on. Shakespeare and Co is in the glitzy 5th arrondissment, which is home to a wide variety of bistros and cafes catering to all tastes. Walk west along Boulevard Saint-Germain and explore some of the side streets to find somewhere off the beaten tourist path to eat lunch. Alternatively, treat yourself to a fancy lunch aboard La Nouvelle Seine, a restaurant barge floating in the river just in front of the Notre Dame. The prices aren't too crazy expensive, and the views are to die for. If it happens to be a Sunday, go for Le Brunch set menu, which costs €26 per person. 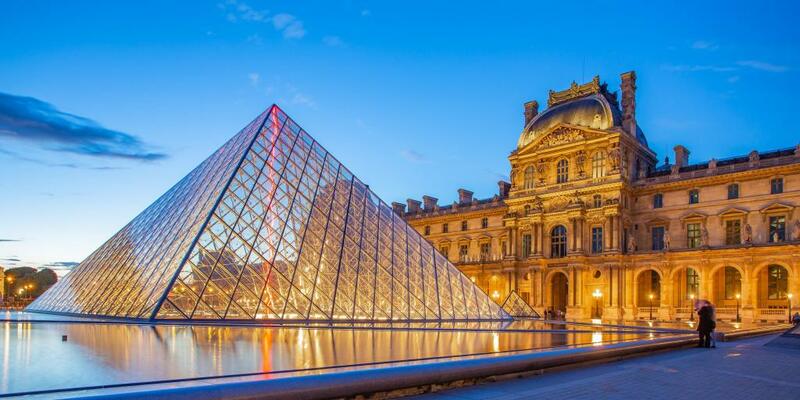 Once you're ready to hit the road again, make your way to the the Louvre on the other side of the river. The entrance to the museum is within a glittering glass pyramid right in the middle of the palace courtyard - you can't miss it! The Louvre is famously home to the Mona Lisa painting, Leonardo da Vinci's best known work. This is definitely a highlight of any trip to the museum, but be warned: it tends to be smaller than one imagines and the room where it's on show is often super packed. Fortunately, there are literally tens of thousands of other masterpieces to admire, from Greek sculptures to Egyptian artefacts and paintings from the Romanticism period. Fun fact: It would take you a full 25 days to look at every single piece of art in the Louvre for a minute each, so use your time wisely! You can buy your tickets online ahead of time at €17 each to avoid queuing, or purchase them on the spot for €15 each. Once you exit the Louvre, you're in the prime position to see a few more incredibly iconic Paris landmarks. We'll start with a stroll through Jardin des Tuileries, which was originally created as the garden of Tuileries Palace under Catherine de' Medici in the 1500s. Throughout the centuries, the park has attracted Parisians and tourists alike, who are drawn to its harmonious atmosphere and natural beauty. Tuileries is the paradigm French garden, all intricate landscaping and extremely well manicured lawns. If you walk all the way through Tuileries you'll end up at Place de la Concorde, a stately city square centred around an Egyptian obelisk. 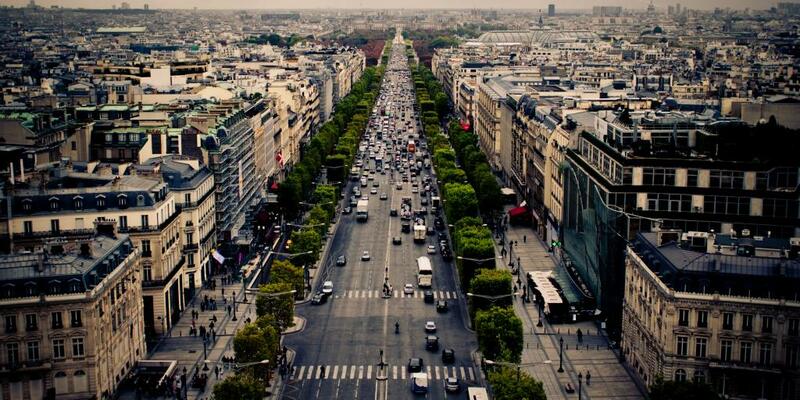 This monument marks the beginning of Avenue des Champs-Élysées, one of the world's most famous shopping streets. And on the opposite end of the Champs-Elysees you'll see the magnificent Arc de Triomphe, built in the early 1800s to commemorate Napoleon's victories. This world famous thoroughfare is lined with dozens of theatres, chic cafes and designer shops. If you're doing your Paris city break in the winter time, the trees are all illuminated with sparkling fairy lights and bright Christmas decorations, adding even more charm to this already delightful area. Spend as much time as you'd like strolling around the Champs Elysees, but bare in mind that we still have a few more things to see today! When you're ready, walk southwest along Rue de Bassano towards the Jardins du Trocadero or hail a cab to your next stop: the Eiffel Tower. No matter how many times you've seen it in photos, movies or postcards, the Eiffel Tower still doesn't fail to impress - especially if you've never been to Paris before. It was constructed as part of the 1889 World Fair and, like many landmarks that are way ahead of their time, was considered an eyesore for quite a few years. 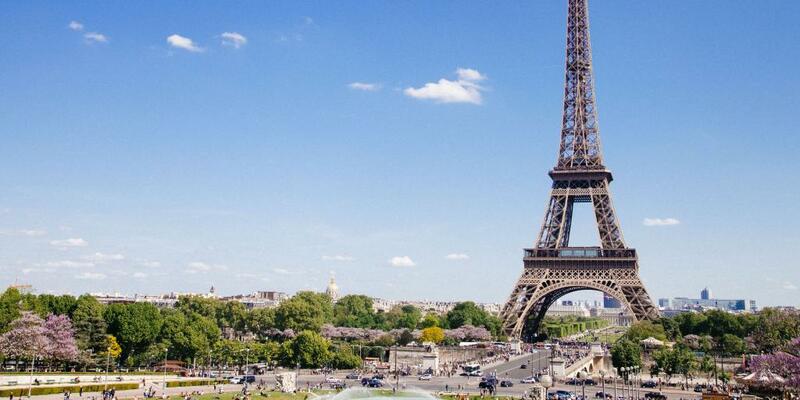 Luckily, plans to demolish it 20 years after its construction were eventually shelved, and these days the Tour Eiffel is one of the most famous monuments in Europe, if not the world. In the summertime the Eiffel Tower is open from 9am to midnight; time your visit carefully in order to avoid long queues (before 11am and after 5pm are generally best). If you're up to it, the climb to the second floor consists of a healthy 704 steps - the perfect way to work up an appetite before dinner. If not, you can ride the lift to the top and admire the views. Head back to your hotel for a rest and perhaps a short nap. We've covered a lot in just two days - and there's more to come! When you're ready, put on your beret and other cliched Parisian clothing and head out on the town. 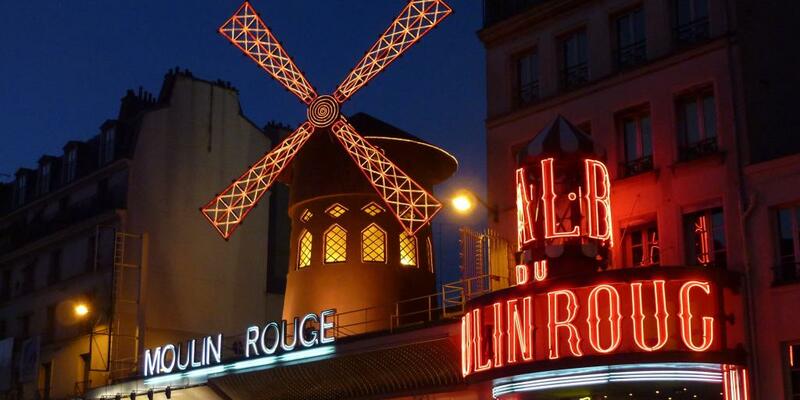 It goes without saying that the dinner options in Paris are all but infinite, with everything on offer from traditional French food to Asian fusion, American-style diners, vegan eateries and Michelin-starred restaurants. For the French-i-est possible option, head to Le Relais de L'Entrecote, a veritable institution of Paris. At this iconic restaurant on Boulevard du Montparnasse, they do one thing and they do it very, very well: steak frites. Here's how it works: The waiter asks how you like your steak, then they bring out wine, bread and a simple green salad to start, followed by the main act. It's not exactly a romantic candle-lit dinner, but the restaurant has a pleasant, family-friendly atmosphere and you're sure to leave feeling satisfied. An alternative and decidedly trendier option just around the corner from L'Entrecote is Alcazar, which is set in an ultra-chic garden oasis. Lush green plants cascade from the ceiling and decorate the space between tables, making you feel as if you're in your own personal Eden. Even better than the decor is the food - modern updates on classic bistro dishes like roast cod, scallops and lamb shoulder, as well as veggie selections. Last port of call for today is the underground wine cellar at Chez Georges (11 rue des Canettes) for a nightcap. Don't be put off by the somewhat sleepy bar upstairs; down in the old stone cellar below, it's a whole different story. Revellers of all ages and walks of life come here to sip on wine and let loose, creating a magnetic energy. Don't be surprised if you see people dancing on tables and belting out songs until the wee hours! On the final day of your Paris weekend trip, treat yourself to a leisurely brunch - or le brunch, as they say here (easy enough) - in the morning. There are loads of options to satisfy your every craving, from Cajun-style eateries to classic eggs-and-pancakes spots. Check out our guide to the 12 best (and coolest) brunch spots in Paris for inspiration. Once you've fuelled up for the day, make your way to Musee d'Orsay, a fantastic museum on the Left Bank housed in an old train station. 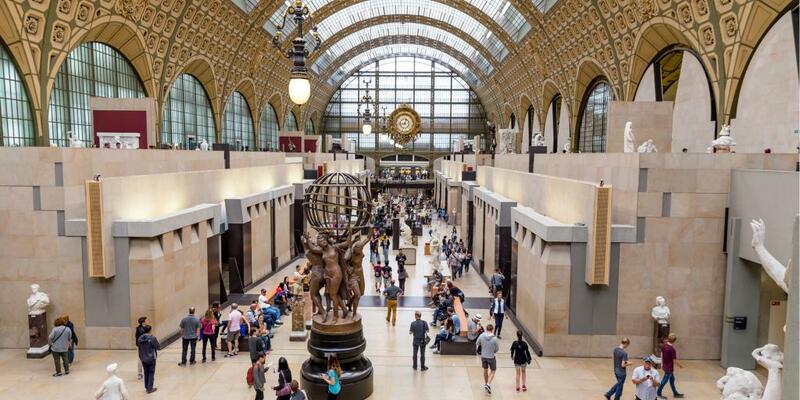 Musee d'Orsay is home to a staggering number of impressionist and post-impressionist masterpieces by famous French and global artists including Manet, Rodin, Toulouse-Lautrec, Renoir and Klimt. Not only are the exhibitions incredible, but the building - built between 1898 and 1900 - is a work of art in itself. Many (us included) would say that if you had to choose just one museum to visit in Paris, Musée d'Orsay would be it. It's calmer and more manageable than the Louvre, and no less captivating. Fun fact: Before it was converted into one of the largest art museums in Europe, the building was used as a set for several films, including Kafka's The Trial, as adapted by Orson Welles. By the time you've spent a couple of hours here (and scooped up some souvenirs at the gift shop), you will have probably worked up an appetite. The museum itself is home to two lovely dining options - the casual cafe on the fourth floor and the decidedly fancier restaurant on the second - if you'd rather stay put. For something a little simpler, grab a salad or soup and a juice at Compose on Rue de Bellechasse or pop into the brand new Cuppa Cafe for specialty coffee and scrumptious vegetarian dishes. Walk west along the Seine to the Assemblee Nationale Metro station. Hop on the 12 Metro in a northern direction until you reach Abbesses (8 stops away). From there, it's just a 10-minute walk uphill to the top of Montmartre - the finest viewpoint in all of Paris. Top tip: If you have any mobility issues or don't feel like climbing the stairs to the top of the hill, why not hop on the funicular? It costs the same as a single ride on the Metro and takes just a minute. And if you're travelling with kids, they'll love the novelty of it. 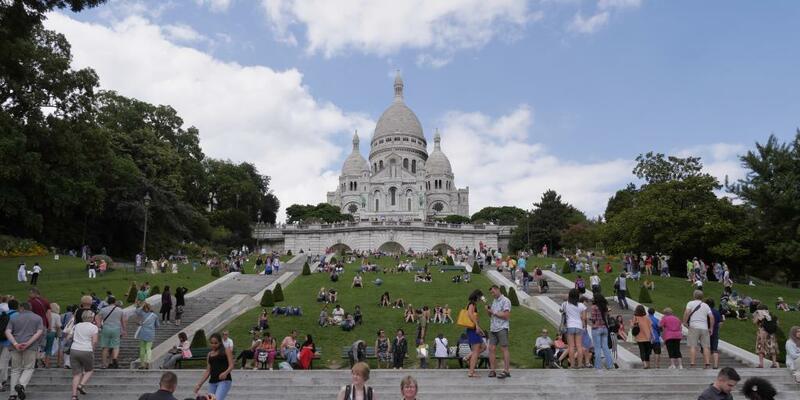 The Basilica of Sacre Coeur is the cherry on top of the Montmartre cake, marking the highest point in Paris. With its distinctive white domes and sleek Romano-Byzantine-style structure, the basilica is one of the most iconic buildings in the city. It's open from 6am to 10:30pm every day and admission is free. After you've had a wander around the top of the hill, spend an hour or two exploring the rest of the Montmartre neighbourhood, which was once the bohemian heart of Paris. Find a bar with pavement seating and treat yourself to a glass of red wine and olives while you mull over the highlights of your Paris trip. Just before nightfall, grab a seat on the steps leading up to the Sacre Coeur. This is the best spot for sunset-viewing in the whole city, so soak it in before you head back downhill. Find somewhere near your hotel for supper - or, if you're feeling particularly lazy, why not order room service in bed? Paris is all about indulgence, after all.